Unlike the last historical fiction I reviewed, A Delightful Compendium is remarkably accurate with respect to Karaite halakha and the relationship between Karaites and Rabbanites. The book is a series of letters among the Karaite family and between them and Rabbi Nissim ben Jacob, a historical Rabbanite Gaon from the 11th Century. Rabbi Nissim once headed the Rabbanite yeshiva in Kairawan, Tunisia. Rabbi Nissim is an interesting choice of a central Rabbinic character for the book, because the real Rabbi Nissim polemicized against Karaites on certain issues. Fear not, though, the book’s Rabbi Nissim is about as open-minded as they come. The real Rabbi Nissim also wrote Rabbinic tales, translated into English and published as “An Elegant Compilation Concerning Relief and Adversity” – which serve as the inspiration for personality of the book’s Rabbi Nissim. I was so moved by the A Delightful Compendium, that I actually created a Compendium to A Delightful Compendium for people who read the book and seek additional detail on the real life inspiration for some of the book’s content. You can see my compendium at the bottom of the post. What drove your interest in writing the book? First, I was an English major in college and have always wanted to write a novel. Second, I wanted to tell the story of a rabbinic story-teller. Third, I did not read Arabic at the time I first drafted the novel (I have learned since), so I did not feel it appropriate to write a work of scholarship on the topic. Fourth, I live in New York City – everybody here believes we have one novel inside us waiting to get out. I suppose if I lived in LA I might have written a screenplay about Rabbanites and Karaites. Did you learn anything new about Karaites and their halakha while researching the book? I learned an enormous amount about Karaites while writing, but had already garnered a great deal much earlier when doing a scholarly edition of the Midrash on Proverbs, which contains some anti-Karaite polemic. Asking what is my favorite part of the book is like asking which of my children I love more. I love all parts of the book, each in its own way. It is a funny thing how someone falls in love with their own writing. It’s a dangerous thing, too! I am grateful to have had a very good (and very strong) editor. The main Rabbanite character is Rav Nissim Gaon (or Rav Nissim ben Jacob). Why did you choose him as a central character in the work? Rabbenu Nissim was fascinating to me in that he was a very well-known halachic authority and yet found time to make a compendium of rabbinic tales (aggada). This aspect is what captured my fancy. When my wife and I were on vacation once in Tunisia we visited Kairawan, and that settled the matter! If readers wanted to learn more about Middle Eastern Jewish life in the Middle Ages, what books/resources would you recommend to them? The best thing to read is the multi-volume work by Shlomo Dov Goitein, A MEDITERRANEAN SOCIETY. Virtually every page is fascinating and his scholarship is prodigious. What can Jews today learn from the Jewish diversity of the Middle Ages? We must learn to perform the commandment to “love our neighbor as ourselves” every moment of every day. 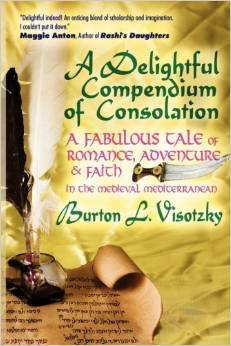 While A Delightful Compendium is fiction, it is rooted in history and remarkably accurate in its portrayals of Karaite-Rabbanite relations. For those individuals interesting in learning some of the history behind the events, I provide this Compendium. In the historical notes, I provide sources and or links to my previous posts. Warning: Do not be misled by the Historical Notes; because the book is fiction the characters – even if they are inspired by real characters – may take different courses from their historical counterparts. 1 al-Basir, Yusuf Dunash mentions al-Basir as a Karaite who disagreed with other sages regarding the proper lineage for Karaite marriages. al-Basir – a Karaite Sage from the early 11th Century – was known by the Hebrew name Joseph ben Abraham Ha-Roeh. He was the teacher to the Karaite sage Yeshua ben Yehudah. Yeshua was among those advocating for a change in the Karaite understanding of the forbidden relations/marriages set forth in Leviticus 18.
al-Basir wrote al Kitab al-Muhtawi, which Hakham Moshe Firrouz would like to see translated into English. 2 Cemeteries, Ritual Impurity Nissim mentions that in the Rabbinic tradition gentile cemeteries do not make one ritually impure – and he adds that he does not know the Karaite position on this issue. 3 Charity between Karaites and Rabbanites The characters are often referring to the support that Karaites and Rabbanites provide each other. Indeed, despite their differences, Karaites and Rabbanites have often looked out for each other. The Karaites contributed to the Rabbanite Yeshivah in Jerusalem, and Karaites and Rabbanites often looked after the poor of the other community. 4 ben-David, Anan Nissim says that Karaism was founded by Anan ben David, who rebelled against the Rabbis after he was passed as leader of the Babylonian Jews. I do not know whether this view was held by the real Nissim, but it was a common polemic raised by Rabbanites against Karaites. I doubt very much that this story is authentic. In any event, Anan’s followers were the Ananites, a non-Rabbinic movement that eventually merged with other non-Rabbinic movements to become the Karaites. Nissim says that both Karaites and Rabbanites benefited in their understanding of Scripture from the methods learned from Arab grammarians. It was definitely the case that Karaites and Rabbanites learned from Arab grammarians. 6 al-Hakim Nissim mentions how the Jews (both Karaites and Rabbanites) suffered under the ruler al-Hakim. al-Hakim was a Fatamid Caliphate who issued decrees against Christians and Jews. During his tenure a synagogue in Morocco was converted into a mosque; other synagogues and churches were destroyed as well – including the Church of the Holy Sepulcher in Jerusalem. 7 Hostilities, between Rabbanites and Karaites Karimah states that there is too much bad blood between Rabbanites and Karaites, and that the leaders of the two communities have put each other under bans. She urges her brother not to have any part in these disagreements. There were definitely hostilities between Karaites and Rabbanites at the time. Karimah’s sentiments are reminiscent of the letter the Jerusalem-based Rabbanite Shelomo ben Yehudah wrote his son in Fustat, dissuading his son from getting involved in fighting between Karaites and Rabbanites, and among the Rabbanites themselves. Quite simply, David ben Isaac is one of the most socially and politically influential Jews from the Middle Ages. Among his activities was his involvement in redeeming captives. Main female protagonist, daughter of Dunash HaCohen al-Tustari A betrothal contract from the Karaite court of Fustat indicates that a Karima b. Hasan married a Rabbanite man. As far as we are aware, it is the only contract in which a Rabbanite becomes a Karaite for the sake of marriage. 10 Kashrut – Milk and Meat In one place, Karimah is listing off her recent sins and she includes the consumption of “milk-and-meat” as one of her sins. This is an interesting one. And it might merit a completely separate post. Karaites historically did not separate milk and meat. In the early 11th Century, the Rabbanites proclaimed a ban on the Karaites, and it was styled as a ban “Against the Eaters of Milk with Meat.” Because Karaites of Jerusalem did not eat red meat, historians interpret this ban to refer to the fact that they would eat poultry and dairy together. This requires more research on my part. 11 Al-Kirkisani, Jacob Dunash refers to Kirkisani as a historian who wrote the Book of Lights. [Compendium: p. 116.] Kirkisani, a 10th Century Karaite, was perhaps the most significant historian of the Middle Ages. Portions of his Book of Lights and Watchtowers have been translated from Judeo-Arabic into English. My dream would be to see the rest of it translated. 12 Mamzer Karimah and her brother are discussing their lineage, and her brother suggests that they would be mamzerim (or products of forbidden relations) if Karimah’s theory is correct. Karaites and Rabbanites have written at length about what a Mamzer is. 13 Marriages, Between Karaites and Rabbanites The book discusses the extent to which Karaites and Rabbanites tried to preserve both customs in their marriage contracts. In some cases, one spouse agreed to adopt the traditions of the other spouse in whole or in specific areas. 14 Marriages, Forbidden Marriages due family lineage Dunash mentions a disagreement among the Karaite sages regarding the laws of forbidden marriages. Karimah mentions that if Karaites remain so strict as to who may marry whom [based on family lineage], there will be no Karaites left. One of the most interesting aspects of the historical Karaite halakha is the prohibition of two brothers marrying two sisters. The Karaites had their own take on Leviticus 18:6-18. There was even a famous excommunication related to this issue. 15 Matrilineal Descent Karimah mentions that the Torah indicates that Jewish descent is through the father, and that this is the religious opinion of the Karaites. She states that, nonetheless, the Karaites also insist upon a Jewish mother so as not to cut themselves off completely from the Rabbanites. Indeed, the general Karaite position is to follow patrilineal descent. And in general, Jews of the Middle East did not marry outside of their religion – so the issue of matrilineal and patrilineal descent does not matter too much with respect to these Jews. I do not know whether the Karaites had a formal practice of making sure to marry Jewish women so as not to cut themselves off from the Rabbinic world. 16 Passover Seder Karimah criticizes the Rabbinic Passover seder for speaking more about historical Rabbanite Sages than about Moses. She felt most comfortable during the Rabbinic seder when they were reciting Psalms, which she says is also done in the Karaite tradition. The Karaite seder includes many Psalms. I gave a talk once about the Karaite Passover Seder and customs for the week-long festival that follows. 17 al-Qumisi, Daniel Karimah refers to Qumisi as her teacher, and mentions his ruling that it is forbidden to eat the blood of fish. Dunash refers to Qumisi as one who appealed for Zion. Karimah mentions Qumisi’s insistence that Jews come and settle Jerusalem. Qumisi is one of my favorite historical Karaites. He was a Karaite mourner of Zion and was known for encouraging his readers to search the Scripture for its true meaning. Qumisi indeed held that the blood of fish was forbidden. 18 Sabbath Candles/Fire Karimah mentions that she is scrupulous not to kindle any flames before the Sabbath and she tries not to derive any benefit from Rabbinic use of such flames on Shabbat. Indeed, the historical position of Karaites is that we must not cause a fire to burn on the Sabbath. This is based on the Karaite interpretation of Exodus 34:3. In at least one case, a marriage document between a Karaite and a Rabbanite provided that the Rabbanite groom would not force his wife to sit by the Sabbath candle. 19 Synagogue, Jerusalem Karaite In Jerusalem, Karimah mentions that the Karaites have their own gathering house. The Karaite synagogue in Jerusalem is the oldest of all the synagogues in the Old City, and as far as I know it is the oldest Jewish synagogue in the world in which Jews still worship. 21 Yefet HaLevi Dunash has a trading partner named Yefet HaLevi. The Karaite Sage Yefet ben ‘Ali HaLevy produced wonderful biblical commentaries, including his commentary on Ruth. His works influenced many Rabbanites, including Ibn Ezra. 22 ben-Yeroham, Salmon Dunash refers to Salmon as the author of the Book of the Wars of the Lord. Salmon, a 10th Century Karaite Sage, was a masterful biblical commentator. He also wrote the Sefer Milhamot Hashem (Book of the Wars of the Lord), which sharply polemicized against the Rabbanites. 23 Yom Tov Sheni (additional day of holiday in Diaspora) Karimah states that Karaites in the Diaspora have no interest in adding days to their holidays and having a second seder. Karaites do not add an additional day to any of their holidays in the Diaspora. al-Kirkisani reports that he asked a student of Sa’adia Gaon why the Rabbanites would marry the Issawites, adherents to a 7th Century Jewish messianic leader Abu Issa al-Isfahani, but would not marry the Karaites. Historians understand the student’s answer to suggest that that reason Rabbanites did not marry Karaites was because the Karaites did not celebrate an additional day for the holidays outside of Israel. *All references to Heresy are to Dr. Marina Rustow’s Heresy and the Politics of Community. Ok, now I GOTTA read this. Thanks a bunch!